"So these are your treatment options..." I choke back a sob and let my voice trail off. How do I present a 30 year old mother of 5 with the fact that we've already done all we can do? "...I will support you, whatever you choose." I turn so she doesn't see me blink back the tears. "For me, I would like to choose life." The words are steady, certain. "My children are still so young. I would like to live." I choke with all the times I have taken this breath in my lungs for granted. The tears burn hot but I try not to let them fall. Not yet. Its not over yet. Yes, dear friend, oh yes, how I want you to live. There are days we stare death in the face around here. Sometimes the right diet and medication just isn't enough and the heart pumps too hard and the chest heaves for breath and we see it coming. Other times we blink and a life is gone. Sometimes friends cling tightly to life and are given a miraculous second chance. Other times they cling to my hand as I whisper that Jesus is right on the other side and they slip away to be with Him. I feel it coming, but I don't want to. I watch her smile at her children and I can't help but hope. I know the God who works miracles, the One who calls things that are not as though they were. I know Him, and I can't help but ask it, "Oh Lord, might she live?" I think of a few men carrying their paralyzed friend on a mat, desperate to lay him at the feet of Jesus. I think of how cumbersome it must have been to try to get him up on that roof, how difficult it must have been to remove the tiles so they could lower him down through the ceiling to the Lord, into the middle of the crowd, right in front of Jesus (Luke 5:17-25). I think I know the desperation they must have felt, the urgency to get him there. I remember that because of the faith of the men, Jesus forgave their friend's sin, and for His glory alone, He healed that man's legs as well, told him to get up and walk. And I, too, want to choose life. And even when I have seen one too many die of this horrible, life-sucking disease we call AIDS, I want to choose to fight. And even when temptation and despair is overwhelming, I want to choose hope. And even when man's sin and depravity threaten to be all consuming, I want to choose the victory that is in Christ Jesus. I want to choose Life. I know the prognosis. I read the reports and the chest x-rays and the liver panel and I knew the doctor's speech before he gave it, that the antiretrovirals meant to save her life were tearing her stomach apart and that 80 pounds is just too small for a woman of five and a half feet. I know what the world says. But she would like to live. And I know the Life-Giver. I want to show her. I want to show her how we hope against hope, believe against all the impossible that He who died to give us life is making all things beautiful and perfect. I want to show her the One who is Life and how we know that His ways are better and higher and that He is working all things for our good, but still we can ask for a miracle; we beg for it. I clasp her hand and I close my eyes and tonight I want to bring her into the middle of the crowd, right in front of Jesus. I tuck them all in and I hand her a glass of milk with her medicine and we watch her children's chests rise and fall with sleep on these mattresses all over the floor as hers heaves hard for each breath. I know the Life-Giver. So tonight I lower my friend Katherine through the roof. I beg on her behalf, on the behalf of her children that she might know Him more and that for His glory alone He might heal her, call her to get up and walk. Absolutely joining you in prayer! What a gift you are to Katharine and her children. Absolutely, I join you. Praying hard. Oh, Katie. I have no words. Only tears and prayers. praying hard for this woman and her family today. I know God hears our prayers and He will answer in His way and in His time. Joining with you to call on His name in hope and love. Praying for this sweet mama and her kiddos. And praying for you, Katie, as you love and serve and are blessed to be the hands and feet of Christ. What a hard blessing! praying dear sisters. praying. my heart aches at AIDS & how it is tearing families apart even though there is treatment and medicine. I pray she can live so her children can know their mother and have her and not become orphans. this hits home as my son became my son due to his birth-mother having the horrible disease. praying for them all. This is so beautiful. Praying for Katherine. prayed for her and will continue to pray. Most Holy God, hear the prayers for this precious mother today. Breathe life into her body. Hear the cry of her heart to live and care for her children. We accept your ultimate will, but also know that we can come before you and ask...we ask for life! Also, be with Katie and those caring for her and her children. Bring them strength and wisdom...and peace. Allow them Your super-natural and super-abundant strength. Show Yourself strong, Father. praying right along side you katie...for katherine and her babies too! I am praying for this precious woman and her children! I have no idea if you will read this, Katie, but perhaps if it doesn't help this woman, the many others who suffer from HIV/AIDS that you come across may find help? There is research showing that enzyme therapy can be effective in treating HIV and AIDS patients. I will link you to a short article as just a summary, (I am not associated with this website or anything to do with enzymes, I'm just a mama whose heart breaks for the precious people and families affected with HIV/AIDS! ) Just came across it on a web search as it contains a good explanation. Maybe there would be a way to obtain this type of treatment in Uganda? It is natural, unlike so many of the harsh drugs that have to be taken, and it looks like it may be promising. It's something to look into. Maybe there would be a way to obtain this type of treatment in Uganda? It is natural, unlike so many of the harsh drugs that have to be taken, and it looks like it may be promising, and not of high cost. It's something to look into. Praying for Katherine and her children. Thank you for sharing her story, Katie. Praying for Katherine and her children. Thank you for sharing her story. She is beautiful. Yes, I am praying. God's will be done. Praying for Katherine, her kids, you and your family! Oh, Katie, you have touched my heart this Christmas season. I am so guilty of taking so much for granted, such as the air that I breathe. May our God supply you with extra strength as you minister to these dear, dear people going through such tough, tough times. Christmas blessings! Praying for Katherine, her kids, you and your family! Trusting and knowing that the Lord is good and He is in control! I will be praying!! Lord, may Your glory heal this mother. I pray she will live - to worship you and to care for her children! Holy Spirit, I pray Your peace and love will envelope her. May all the glory be Yours and Your power be known through her life, Lord. In Jesus name I ask these things. I pray with you Katie that this mother(and child of God) would be healed to bring glory to God and to touch the lives of unbelievers everywhere. Standing with you, praying that the Great Physician breathes life into Katherine. That He heals the broken and sick parts. That He restores her body to the perfect way He created her. Praying alongside you for Katharine. I will earnestly lift Katherine up in prayer. May she feel God's power all over her and rise up completely healed! Our God is bigger than this horrible disease. May she look forward to many more years with her precious children. Prayers for Katherine and her children! God's love and power know no bounds. I will pray for a miracle. Oh, beautiful lover of God, I join you in praying for this precious child of God and for her children. Precious Lord, take the hand of this one you created and have known before the foundation of the world...lead her right to the throne room of God, right into the center of your heart. Father, give her enough strength to let go of her will, of her lack of understanding of who you are, of fear that this disease will take her life soon and allow her to listen to Your mouthpiece, Katie, as she offers her Your eternal life! Lord Jesus, grant Katie the time and patience and discernment to speak at just the moment you would have her! May the sweet Holy Spirit fill her body, soul and mind...and those of her beautiful babies...so that if she is to be absent from this earthly life they all KNOW she is living in Your presence. May Your will be done "on earth as it is in Heaven". I ask this humbly in the mighty and powerful name of Jehovah-Rapah, our God who heals. Amen! Praying with you for a miracle for His precious child, Katherine. I know He will bring her healing- on His perfect terms and in His perfect timing. WOW. Thank you Katie for including us and allowing us to beg for mercy on her behalf. Praying for Katherine and her sweet children, please keep us updated! Thy Kingdom come Thy will be down on earth as it is in Heaven. Praying for this beautiful woman and her children! Lifting her up to the King of Kings and the Lord of Lords, the Wonderful Counselor, Mighty God, Everlasting Father, Prince of Peace and Great I Am. Thank you Jesus! In your holy and precious name, I ask for Heaven to come down and powerfully flow through your daughter, let Your Kingdom come, Amen! Your love.... for Your glory alone. yes. praying. He is ABLE. She is beautiful. I prayed with all my might that God would heal her and let her live many, many more years, and will continue to pray. Katie, Yes, I will join you in praying for Katherine, that God in His great mercy, will heal this young woman, and grant her more time with her precious children. I will also pray that God will give you His strength for this heavy burden. Yes. We will. God bless. Yes, I am joining with you. My hand is on the rope and I am looking intently into the crowd to find the One Man who is stretching forth His healing hand over those who come before Him. He hears the cry of your heart and this mother's heart even before a word is spoken. He knows. He alone has the power to set aside the prognosis and bring life where disease stalks its prey. I am standing with you, sister. May the Lord's healing hand be stretched forth this day. In His precious Name! This is my first time to read your blog. I just finished reading your book. Of course, I will pray for your dear friend. Today is Santa Lucia Day, I believe. One of the darkest days of the year when the light of a candle is needed and appreciated the most. I'm sure many will light their candles of faith for her. We are currently trying to adopt from Russia with HIV as a special need. Uganda may be our next stop. Thank you for introducing your country more to me in your book. Yes Katie. Praying here in a little corner of south Texas. Yes I do join you in your request! we serve an awesome God and nothing is impossibe for Him! I am with you and praying. I will pray for her and her children! I just finished your book. Thank you for writing it. I am so thankful to be able to join you in praying for life. For God's healing touch on her body. Right there with you, Katie. Bringing her to His feet and offering her for healing. Joining you in prayer, yes, joining in prayer. Joining with you to bring Katherine before the Life Giver! Praying with you tonight . . .
asking for a MIRACLE from the LORD . . .
lifting her through the roof with you . . .
to set her at Jesus' feet. He is a God of MIRACLES. Asking & Believing with you tonight . . .
that the LORD will touch this Mama with His touch. Praying, praying, praying for this sweet mama and her kiddos! praying for Katherine and her children tonight along with you, Katie. I join my faith with yours and lift this beautiful sister up to our Lord, Jesus the healer, the might God, the maker of heaven and earth. Nothing is impossible with God! praying for your friend! what a beautiful mother she is! Yes, I will join you and take Katherine to Lord in prayer for complete healing. She chooses to live... The least I can do is choose to pray. That I will do! Katie, I am praying with you. It is my honor to pray with you tonight for your dear friend...I want to come along side you and do just that at this very moment...her smile is beautiful just as each of her children are beautiful! Praying and believing with you! What a mighty God we serve!! Joining you in prayer for your precious friend. I don't know you, but found this blog via pinterest...and I am so glad I did. Your words (God's words) remind me to treasure every moment and seek out opportunities to love and bless others. To be an example of his love and grace. I am praying for this sweet woman and you, that God delivers her according to His plan, and giver her and her family peace. Praying for you and this sweet woman, that God deliver her according to his plan. I pray peace for her and her family, that God blesses them above and beyond their wildest expectations. I am so glad I found your blog, it is a challenge to me to treasure and look for ways to bless others in my everyday life. Praying for you and this sweet woman, that God bless her and her family above and beyond their expectations. That He deliver her according to His plan, and give them peace. I will pray. One of my favorite chapters in the Bible that has helped me hope in the God of the impossible - the God of the resurrection is 2 Chronicles 20 . . .
2 Chronicles 20:12: O our God, will you not execute judgment on them? For we are powerless against this great horde that is coming against us. We do not know what to do, but our eyes are on you. May your eyes always be on Him. Yes, Yes, Yes we will join you in believing for God's perfect healing! I am praying! Yes, Yes, Yes I am praying and believing for God's perfect healing and His perfect plan for your sweet friend and her dear family. Praying with you, friend, and trusting. Praying for your sweet friend & this sweet family. Thank you for sharing. Praying for your sweet friend and her sweet family. Praying for this beautiful woman and her children! I know we serve a mighty God who is able to do immeasurably more than all we ask! 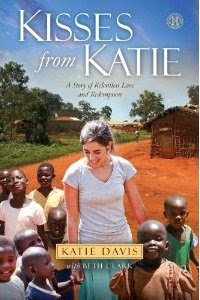 I am praying that God will heal Katherine so she can raise her children. I want to have the faith that can do more than move a mountain, it can heal a woman across the ocean whom I have never met. I am sending hope for strength and healing. I am sending love. Praying hard for your sweet friend. Her lovely face smiling w her sons... It could be any one of us. Absolutely Katie...we're holding the mat an ocean away. Lord in the Mighty name of Jesus please touch this woman's body and heal her. I will pray with you, Katie. Jesus is good. God is good all the time. Praise god our Father, Who is in heaven, who heals! Thank you for Jesus who healed me of my sin! I pray for your friend Katherine. Oh! I am crying, "kneeling on the roof" like the friends who lowered the paralytic before Jesus, searching His face to see what He will do, asking for that miraculous touch. Some day I hope Katie i can meet you.I want to learn more of you! Truly sent from heaven.I will always pray for your ministry. We will be praying for Katherine along with you, and her children, also. He sees, He hears, He moves as He will. So glad you were there to hold her hand! reading of such faith is inspiring and encouraging, may our Lord be gracious to our sister. Lord, I pray you will heal Katherine. We can always trust Jesus to be who He says He is. And if He says He is Jehovah Raphah, our Healer, then we can trust him to be that. Jesus never turned away anyone who came to Him asking for healing. And he can be trusted to be the same Jesus today as he was in the New Testament. We know that He CAN heal, and it is His desire and delight to heal. I will be fighting in prayer for her life. We are all easily deceived and so we are vulnerable to doctrines of demons...I would seriously encourage you to read this article and pray for God to show you His truth. For your glory, will you please heal Katherine. Fill her lungs with life giving breath. In Hope and Faith, I too bring her to your feet. Almighty God, if it is your will, please keep my sister here with her children for just a while longer. Lowering her through the roof with you this morning. For His glory, and because of His great love! Dear Precious Lord Jesus I pray right now for this mom who is struggling to live and to breathe. O my Father that you would reach down and work a miracle of saving her life. Oh Father, our creator who knew her name before she was even born, who has plans for her life and plans for her precious children. Father we ask for you to make her strong, heal her disease for your honor and for your glory. Pleae be with Katie as she faces this situation. Make her strong, fill her with peace and joy. Help her through this day and those to follow. Meet all of her physical needs. Thankyou for her life and for her service to you. For sharing with all of us on this website so we may have the blessing of joining her in prayer. Thank you Jesus for what you will do. Praying for Katherine, please let us know what happens. Oh Katie, my heart breaks. I promise to lift Katherine up in prayer. I also lift you and her children up to be strengthened at this time. I am praying with you over here in Alabama. Desperately seeking God and asking for healing on behalf of Katherine. Absolutely. I am praying for Katherine. Yes, I will join you. Yes, I'll join you in prayer. Covering sweet Katherine in prayer today...to Him who is able to do more than we can ask or imagine. Covering sweet Katherine in prayer...to HIM who is able to do more than we could ask or imagine. I will deffinitely be praying for her and her children. That God will give her strength and heal her! I will choose life with you and Katherine. I will, I am, praying for her. Having just finished reading this, my heart is filled with a heaviness that I know comes from God, pressing me to pray. That doesn't always happen, so I notice the distinction. Yes, we do know the life-giver. I don't pretend to even understand when/how/why miracles sometimes happen and sometimes don't, but I will ask. I know I don't understand the power of God that I don't see often here in America. But I ask to see it, I ask for His power and glory and life to be revealed in Katherine's life and body. Yes, Katie. I will join you in praying for Katherine. He is the God who sees and He is the God who gives life. Life here and live forevermore. Praying for you and your family too as you pour Him into her. He is a God of miracles nothing is too tough or impossible. Be it a disease or anything else. Lord even just by the touch of the seam of your garment, I believe Katherine will be healed. I place her in your healing hands, along with her children and her friend Katie. Hear our prayers oh mighty Lord. I just prayed, with tears streaming down my cheeks, to the One who holds all life in His hands- the Healer, the One who loves us more than we can ever imagine. Oh Sweet Jesus! Heal Katherine's body-- for Your Glory! Let her experience You as the Healer, Our Healer. Wrap Your Arms around her, let her know that you are there with her. Let her feel Your Healing touch as she reaches out to You. You are SO beautiful, SO overwhelmingly good. All that we can do is come, kneel before you and surrender sweet Katherine to You. We want her to be healed, to be able to see her children grow up. We ask for Your kingdom to come, for Your will to be done in this situation. Let Your power and Your love be felt! Oh, be there, Sweet Jesus. And hold Katie's heart, too, as she loves, lives, and serves as Your Hands and Feet in Uganda. In Jesus Name, Amen. I have followed your blog for awhile now, and I am always surprised when each new post brings tears to my eyes. God bless you and your work! You are in my prayers. I truly admire you and what you do, and hope I can strive to know God the way you do! Thank you!! Katie, I will be storming the gates of heaven with you for this dear woman. I am mesmerized by the joy in their smiles. Praying with your for her healing and her peace. Just wanted you to know that I joined you in this prayer for Katherine. Thank you for the opportunity! Just wanted you to know I joined you in this prayer for Katherine. What a beautiful family. Will continue praying! I just prayed for this beautiful women and her children! Thanks for sharing! I love that we can get involved in your ministry through prayer! Praying for you too, Katie as you take care of this sweet family! Just prayed for this beautiful women and her children. I love how we can get involved in your ministry through prayer! Praying for you too Katie, as you take care of this precious family. I am joining you in prayer for Katherine, bringing her to Jesus for healing. I am lifting her up with you! How my heart begs for this woman to be healed. I'm lifting her up in prayer with you! Praying for Katherine as we place her at Jesus' feet. Oh Lord, our Lord how majestic is Your name in all the earth. Healer, Savior, Giver of life. Heal Katherine and use it for Your glory. In the holy name of Jesus I speak life into this woman. Come Lord Jesus, come. Praying for Katharine tonight in Kentucky! Praying for Katharine now from Kentucky! Praying for Katherine, her precious children and you and your children, our God is great and mighty! Praying that the Great Healer would reach down and heal Katherine. All the glory to you Almighty Father. Almighty Healer place your hand upon Katherine and heal her. All the glory and honor belongs to You. Praying for a miracle for this woman and her family. Sweet Katie, I will absolutely join you in prayer. After the lame man was healed and Peter and John were commanded to speak no more in the name of Jesus they prayed, "...And now, O Lord, hear their threats, and grant to your servants to continue to speak your word with all boldness, while you stretch out your hand to heal and signs and wonders are performed in the name of your holy servant Jesus..."
God I pray that you would heal Katherine in the name of Jesus, that you would demonstrate your power and the worthiness of your Son, and that all who know Katherine would recognize her as one dying, but that she now stands before them whole, and that they would praise you and that your gospel would be proclaimed, and that thousands would believe. Definitely joining you in prayer. Storming the gates of heaven.. The story makes me pray. I believe God hears our prays and draw them close to him! Praying for God's will and His glory. I'm trusting and praying for that. Thank you for loving Katharine, and for bringing her to us for us to love and pray for her. I am joining you, Katie. I am begging Him. Praying to the Worker of Miracles. May He be glorified in all. Sending Katherine as much love and prayers as I can! Late to the post, but praying none-the-less. Yes, I am praying to! Jesus sings over Katherine today...may she her little ones be blessed. I'm joining you, Katie! Dear Lord, You are the Great Physician and we entrust this mother and her children into Your almighty care and ask for a miracle of healing and hope.